Goooooood morning sunshine and happy Monday to you!! 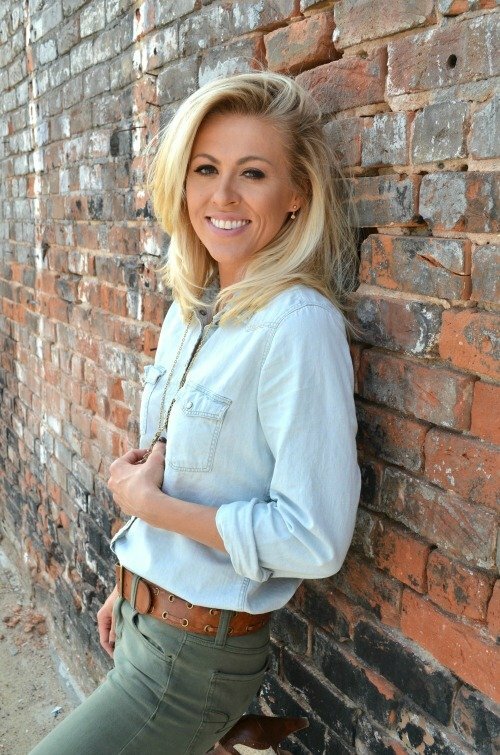 Today is a fun day here on the ol’ bloggity blog because I’m talking about SPRING clothing. Whoot whoot! I figured now that it’s officially April this would be the perfect post to start off the month. 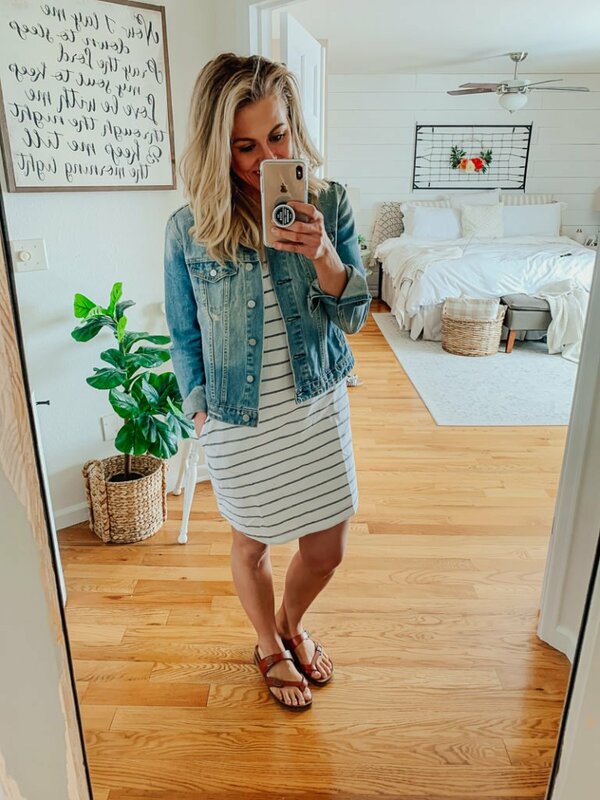 And I’ve actually been really excited about this one because everything I’m sharing is from Walmart’s new spring collection. You guys know I’ve been a big fan of Walmart after I found those recliners for our living room, so why not dive into the world of fashion? I found some really great stuff, including spring dresses, bags, sandals, and the most amazing five dollar t-shirt you’ll ever see if yo’ life. Plus it’s all super affordable and two day shipping. I hope this helps if you’re looking for any new clothes for spring! This post is in partnership with Walmart. 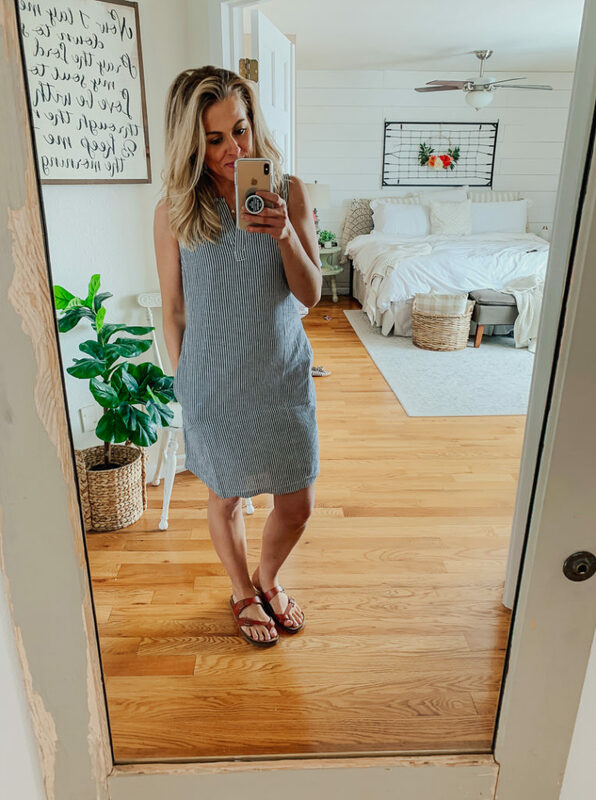 First up I have to share this cute little cotton dress because I seriously LOVE it. 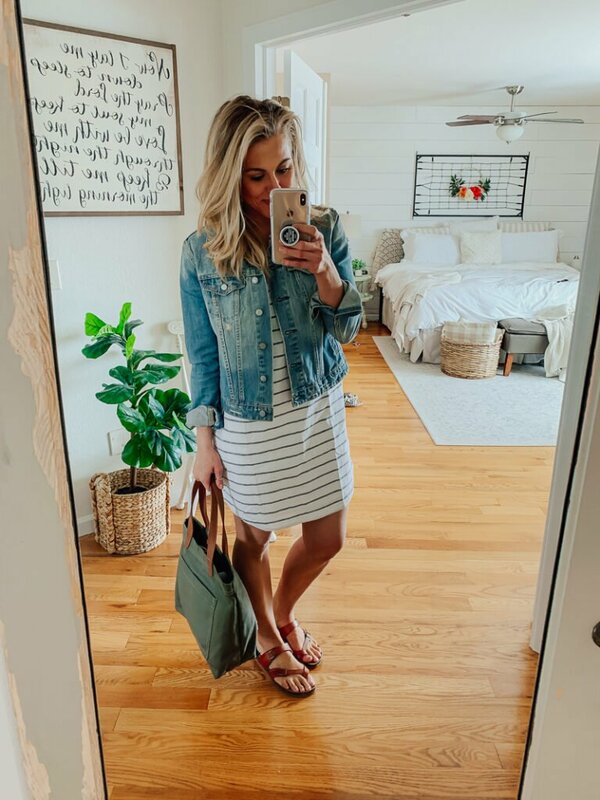 I think this is the perfect dress for spring and summer–it’s not too short and it’s not see through either! 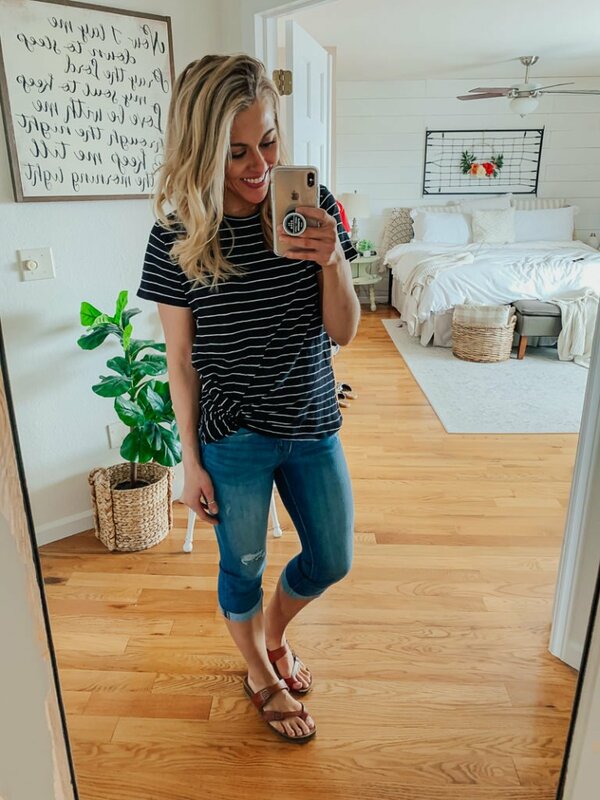 I love the simple stripe design and it’s very comfortable. I feel like I could wear this every day and never get tired of it. This dress comes in several different colors, I got the white and the light blue option. I’m wearing size small for reference. I paired this dress with a comfortable pair of slip on sandals, which are also from Walmart. I am honestly so impressed with these sandals—they are very comfortable and not heavy at all. They come in a few different color options too and I’m loving this floral design. I did order a half size up from my normal size and they fit perfectly! Then I snagged this canvas tote, which I am obsessed with already. I just switched out my purse for it! Next is this simple every day look. 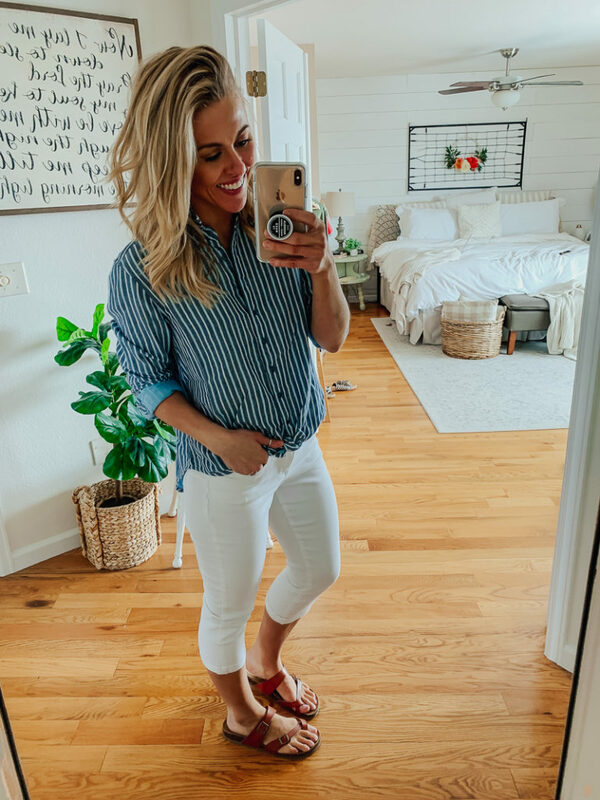 You guys, this button up top is seriously SO comfortable and I love the boyfriend-style feel. It ties in the front and it’s longer in the back, so you’ve got plenty of tush coverage with this one! It comes in several different color options and it’s only $15. I’m wearing medium, but small could have worked too. Then I’m wearing a pair of Time and Tru pants in white. These are super comfortable and a heck of a buy for less than $20. 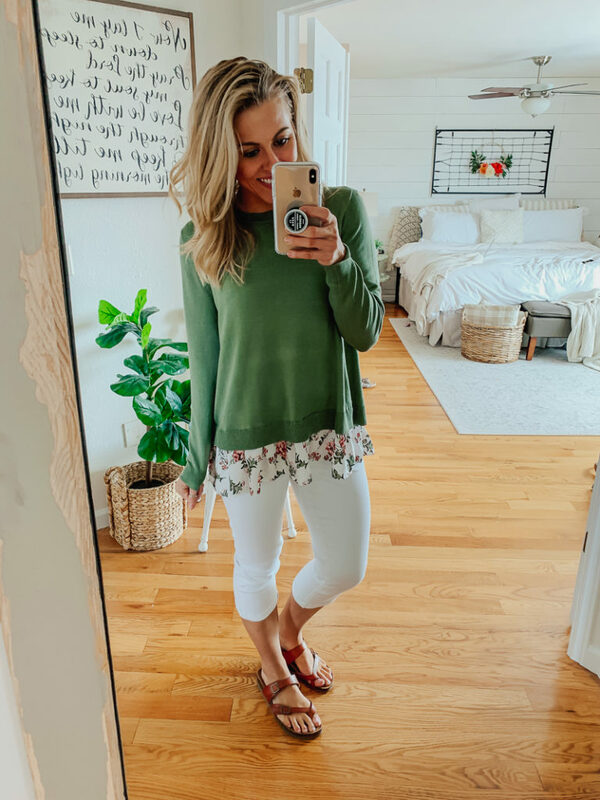 Ok, how darn cute is this floral green sweater?! I honestly wasn’t sure if I would like this when I picked it out, but I actually LOVE it. It’s super light weight, so it would work perfectly for spring and even a cooler summer day with a pair of shorts. It’s also split in the back, so you can see that pretty floral fabric. I’m wearing size small and it comes in four different color options. Next is a basic tee with a cute little twist tie in the front. This tee is longer than most, so if you’re looking for some extra tush coverage this would be a great option for you. Again there are several color options and I’m wearing size small. 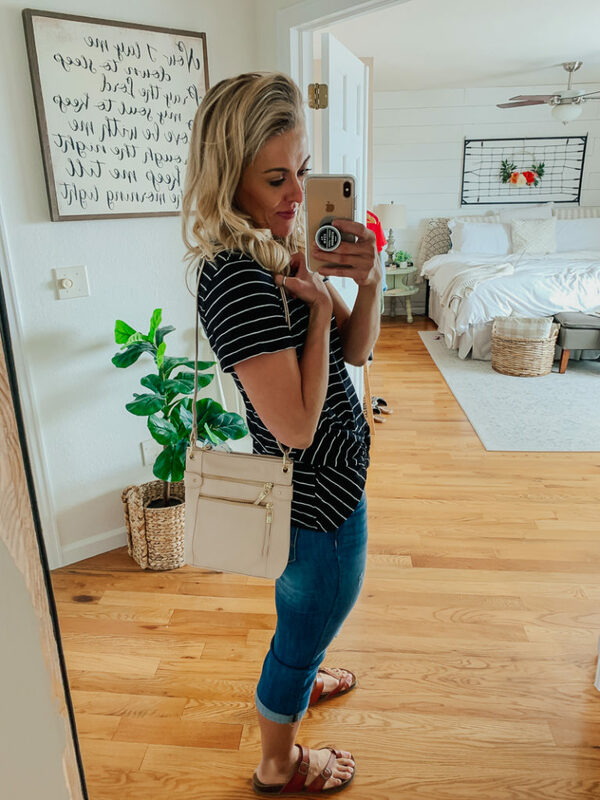 I paired it with Time and Tru pants (in my normal size) as well as this adorable pink cross body bag. I love this bag–it has tons of pockets on the outside, which is super handy. This is the same twist tie tee in white. I honestly prefer the black option because this white tee is a bit see through, but it would still work well with a tank underneath. And can we talk about this huge weekender bag? This bag is great for a day at the pool, trip to the zoo with the kids, soccer games, etc. I’ll definitely be taking this bag next time I need to carry all the things! Last but definitely not least is the most amazing FIVE dollar t-shirt ever. You guys, this shirt totally reminds me of my Abercrombie v-neck tees. The fit is very similar, especially in the shoulder, and I really can’t believe it’s only five bucks. 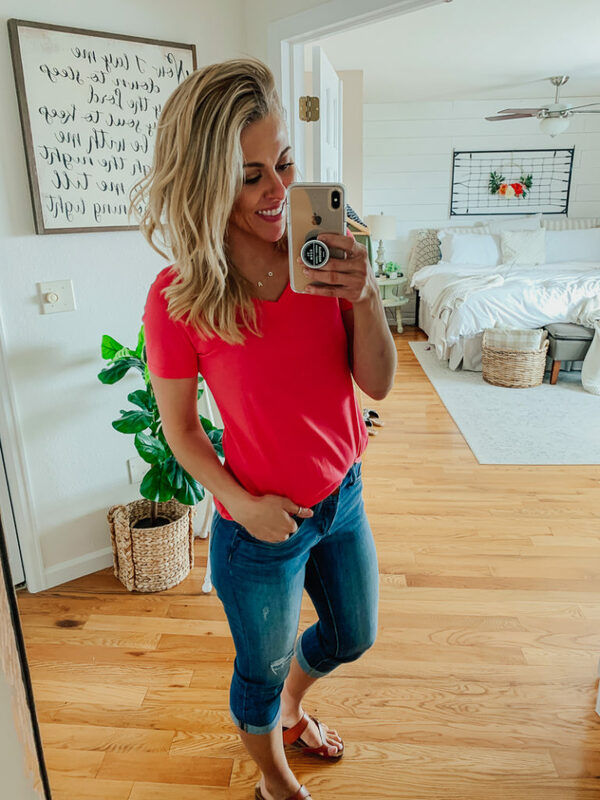 If you’re looking for a great basic tee this is an awesome option. Yessss! They’re a total Birkenstock dupe for a fraction of the cost. I love them! Love all your choices. I often shop Walmart. I just bought an indoor outdoor rug that I am using inside and I love it. I have senior animals and I got tired of them ruining my good rugs. I also just bought some window panels that are lined for 14.88 and they are beairiful. Walmart also carries longer window panels on line. And my favorite casual shoes are some Mary Janes found at Walmart for less than 10 dollars. They are so comfortable. Also their Terra Sky line is so soft and comfortable for us fluffy ladies. I can always find something on their clearance racks too. Another one of my favorite shopping stores is Catos. I tell all my friends that Catos is the best kept secret in town. They also have an on line store too. I do love a bargain. That’s awesome Cindy! Walmart does have lots of good stuff these days and their online selection is HUGE. I haven’t heard of Catos, we dont’ have that around here! So cute Sarah! Does not look like you went shopping at Walmart. They really have stepped up their game! So true, right Suzi?! I haven’t bought clothes at Walmart in years but I’ll def be checking them out from now on. Love this post! I’m all about finding cute clothes at affordable prices!! You look so cute in all of these!! Thank you. Heck yes Kim, I’m all about it too!! You look cute in everything that you wear but almost everything had stripes. You looked so, so good in the reddish top! You should wear color more as that really highlights your face. Thank you Nancy! And I didn’t even notice all the stripes. Haha, guess I just like stripes! ah you’e so sweet, thank you Karyn! I’ve decided I need your tan and this whole wardrobe. So off to Walmart I go! 🤣😍 Thanks for sharing! Girl this tan is fake! I use the Tarte self tanner: https://rstyle.me/n/dgjieeb6hgf I did two coats to get a darker look! I would be lost without your posts in my life! LOL Thank you for always sharing such awesome stuff. I NEVER have time to shop so you are kind of like my personal shopper! I read and then buy! Super cute items!!!!!!! Just wish they were from another retailer. In college, I learned a lot about business practices and polices of some of the most prominent companies in the country, Walmart being one of them. Due to their bad business practices and treatment of their employees, over years and years, I haven’t been able to let myself shop there. As well as their political tshirts that have been deleted from their inventory, after much scrutiny. You look adorable, all the pieces you pick, are so so sweet. Hi Kim! Some were online and some were in store, but I think most Walmart stores have all of these items available if you’d rather shop in person. Sarah, I agree with you that Wal Mart is stepping up their game in so many ways, clothing included! 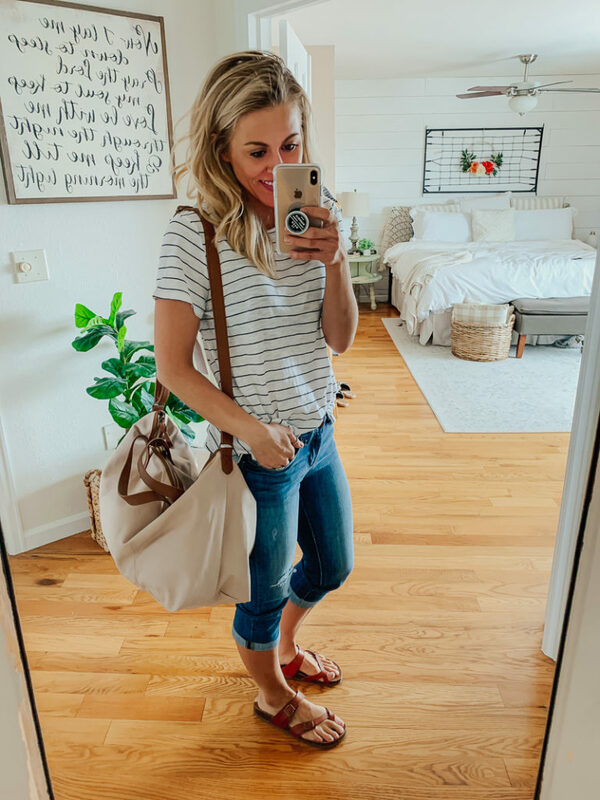 These pieces are so interchangeable and perfect for moms on the go. Thanks for sharing these classic combinations with us. I’m so excited for sunshine and warmer temps! Great looks!! I’ll definitely be taking a closer look at the clothes at Walmart! These look great and are so affordable. I love posts that highlight affordable, easy to find products. Thanks so much!! Have you ever purchased from the JUST FASHION NOW WEBSITE? Quality? Sizing? Super cute things just wondering if its quality or not!! Thanks!